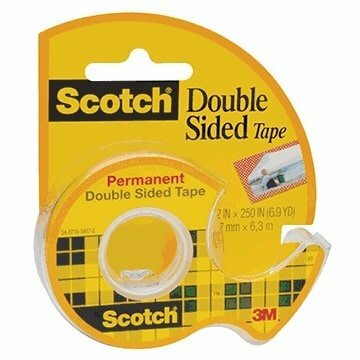 Scotch® Double-Sided Permanent Tape; 1/2" x 250"
Home / School, Art, & Office Supplies / Scotch® Double-Sided Permanent Tape; 1/2" x 250"
3M Company Scotch® Double-Sided Permanent Tape; 1/2" x 250"
Perfect for student projects, photo albums, and for wrapping presents. Tape is coated with photo-safe, permanent adhesive on both sides. A non-mess alternative to glue for light-duty attaching and mounting tasks.